This article is about Ninjago minifigure. For Indiana Jones character, see Chen (Indiana Jones). Master Chen is a Ninjago minifigure released in 2015. 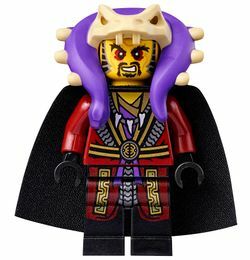 He is the father of Skylor and the main antagonist in the fourth season of Ninjago: Masters of Spinjitzu, as well as a boss in LEGO Ninjago: Tournament. Chen wears a dark red kimono with a golden belt and collar, black gloves and cape, and a unique helmet depicting a an Anacondrai head. Chen was a crime lord and the owner of Mr. Chen's Noodle House. He married the then-current elemental master of amber and the two had a daughter, Skylor. At one point, he was Clouse and Garmadon's sensei and taught them to achieve victory at all costs. Making Garmadon his right-hand man, Chen convinced Garmadon to take Wu's love letter to Misako and pass it off as his own. 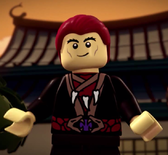 During the Serpentine Wars, Chen fought alongside Garmadon and Wu, but betrayed them and joined the Serpentine. This move was in vain for Chen, however, as Wu and Garmadon managed to defeat the Serpentine. In exchange for his surrender, Chen promised never to leave a secluded island. However, it was on that island that he was able to build his criminal empire and was able to use his goons to open a noodle house in New Ninjago City. Shortly after the believed demise of Zane, Chen organized a Tournament of Elements as a cover to steal the powers of the elemental masters needed to perform a spell that would turn him and his followers into Anacondrai. To lure the Ninja into the tournament, he captured Zane, taking his elemental ice powers, then organized a robbery of his own noodle house wherein Eyezor led the ninja to the back alleyway, where a table with fortune cookies containing their invitations was set up. Early in the morning of the second day after sending the invitation, Chen received word from Clouse, who had taken the ferry to retrieve the elemental masters, that Garmadon had joined them as well. Chen remained confident that he controlled everything and ventured to the dungeons to check up on the captive Master of Ice. When the elemental masters arrived, Chen welcomed them and explained how the tournament would work. He then sent them to their rooms. After the first match, he journeyed to the underground caverns where he used his staff of elements to take Karlof's metal powers. The next day, he summoned Ash, Kai, Bolobo, Griffin Turner, Gravis and Neuro to the arena and watched them battle for the jadeblades, eliminating the losers, but forbidding Clouse to use his dark magic to cheat the ninja. After the tournament, Chen was entertained by his kabuki in the main room of his palace, where Clouse informed him that the ninja had been present at the previous night's ceremony. Chen ordered his right hand man to switch up the fights so that Cole would face Jay, thus eliminating one of the Ninja. At the tournament, Chen eagerly watched, but was dismayed when the two ninja made up and only pretended to fight. To combat this, Chen ordered the Anacondrai Crushers to attack, but they were defeated with ease by the ninja. Chen then began enabling all the trap doors so that neither would win, only for Cole to give Jay the Jadeblade, thus sacrificing himself. True to his word, the next day, Chen had the remaining elemental masters taken far above the island from which point they would parachute down to the island. There, whoever found Nya first would be advanced to the final round. Taking over the DB X, he observed the tournament from within it, remarking to Clouse that it was his new favorite toy. Eventually, he met up with Skylor on a frozen pond after she revealed to the master of fire that she was in fact the spy. Famous across Ninjago as the owner and proprietor of the Noodle House chain of restaurants, Master Chen is secretly the leader of an underground criminal organization operating from a hidden island fortress. In the TV series, he is voiced by Ian James Corlett, who also voices Skales. ↑ 1.0 1.1 "Cartoon Network"
↑ "Only One Can Remain"
↑ 3.0 3.1 "The Invitation"